We wake up, as usual, around 5:20. We want to get an early start, but the lodge’s free coffee service doesn’t start until 6:00, so while we wait, we eat the leftover cake from last night. Yum! 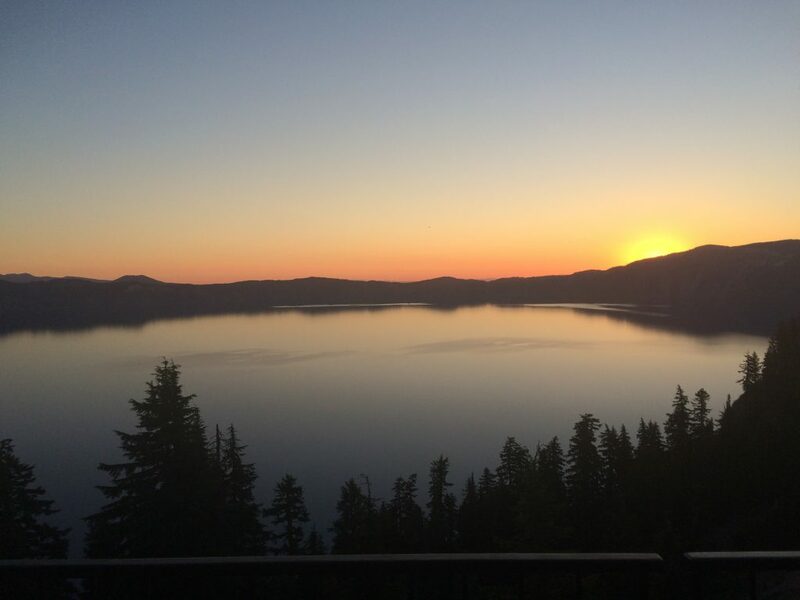 As I catch the sun rising up over the rim of Crater Lake I meet a woman who is also setting out this morning, with her husband and 8-year old son. They’re “doing Oregon”, too, but at a much slower pace. I’m impressed. That kid is really lucky! At 6:15 we’re on the trail. It’s nice and cool this early in the morning. We see people setting up music stands for what will, later in the day, be a musical event. Too bad we can’t stay and listen. But the concert isn’t until 10:00, and we’re worried about water and our legs aren’t superhuman. We’re passed at one point by a trail runner; Marc cheers him on, saying it looks like fun. The guy smiles, grunts and carries on. Later, we chat with a tru-thruer called Sweet Cheeks who tells us that the runner was Karel Sabbe, a Belgian dentist trying to break the PCT supported speed record. Wow!! If we’d known we would have offered much more effusive encouragement! 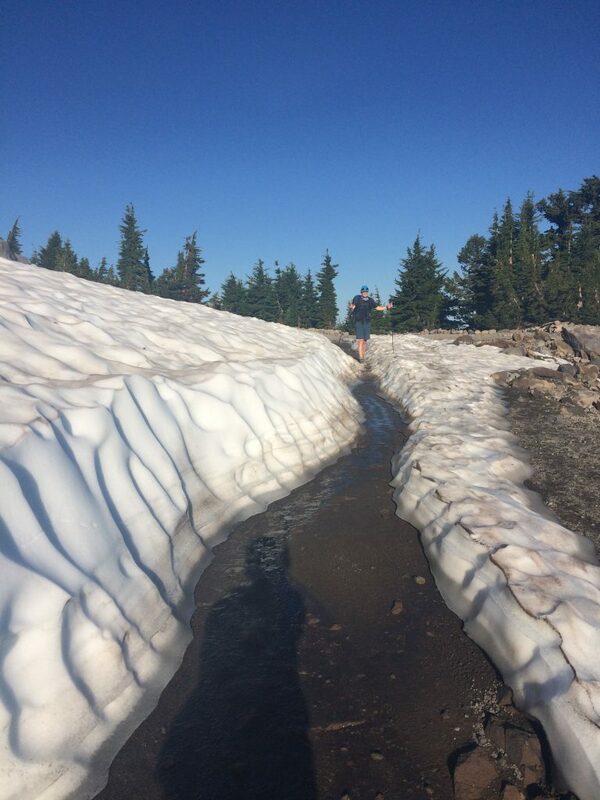 There is a lot of late snow around Crater Lake. Even on a hot day, and after a hot week, lots of it still remains. The Rim Alternate is a gorgeous trail. We’re constantly gazing over at the lake, amazed by its deep blue depths. I wish we could have camped around it, as some hikers did (because the Lightning Spring campground was closed due to the fire) and seen the stars reflected in its surface. We do see wisps of fire to the west, but not any massive plumes of smoke. Eventually the trail leaves the rim and heads over to the Gold Hill campground, where I had originally thought we’d camp, until I learned there was no water here. There are a couple of young women sitting by the trail with a gallon jug of water, which they offer. We initially decline, but they say they really don’t need it, and we make a couple cups of electrolyte drink. It’s nice to take a break. We learn that there’s a water cache here, in the bear vault next to the road. We hike in the heat, in a forest whose trees are not tall or dense enough to cast shade on the trail. I spend the whole day going over and over in my mind the deal I have made with my dad, trying to figure out a way to make it work out. It’s complicated, and keeps me very occupied. 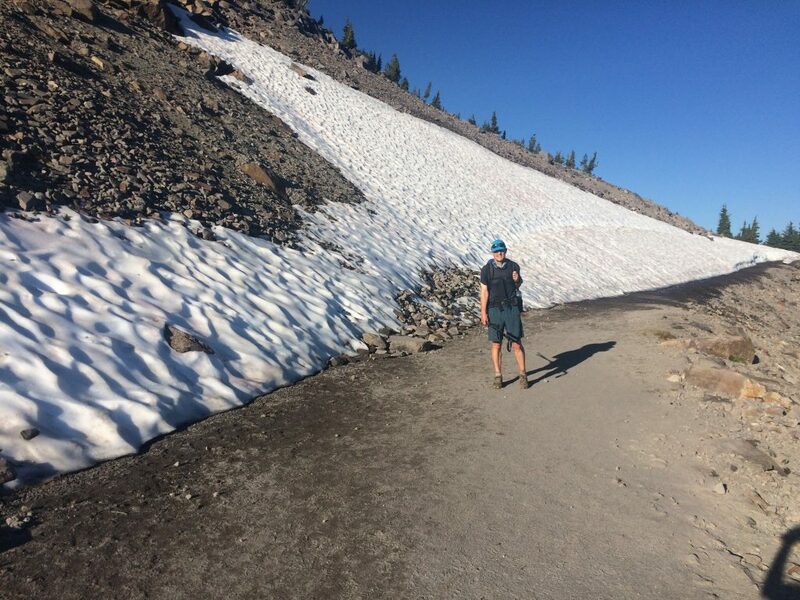 On the last stretch towards Thielsen Creek, we meet a couple, trailnames Bright and Story, who started at the highway and are doing Oregon in smaller bites. They’re hiking to the creek tonight, and then tomorrow will hike out to their car at some other junction. Bright lives up to her name, with a wide, welcoming smile, and Story turns out to be quite loquacious. We enjoy the distraction of chatting with them but soon pull ahead, anxious to get to the creek. I worry, of course, that there won’t be a campsite and we’ll have to hike even further! We stop at the junction for Mount Thielsen, with just two miles to go, because I just can’t hike any further without a break. It’s a nice spot, with a breeze and a view out over the landscape. My heel is bugging me a bit, and when I take my sock off to look at it I notice it’s rubbed raw, probably from dirt that has gotten into my sock. 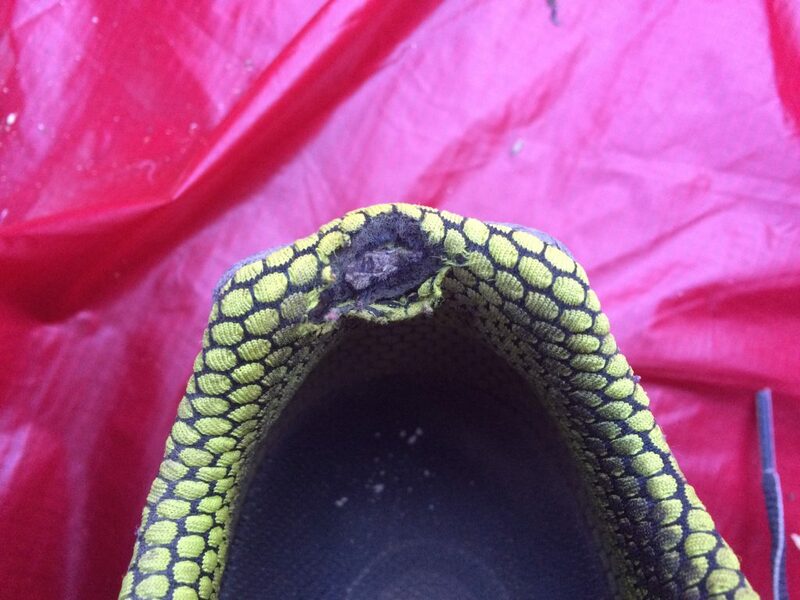 My shoe is damaged, too. I peel some duct tape off my Advil bottle and patch it up. When we get to the creek, the campsite has indeed been taken by a woman wearing a mosquito head net. Instead of barging in on her, we decide to set our tent up on a flattish spot near the creek. The wind is blowing pretty strongly, keeping the mosquitoes away, so it’s very pleasant. I feel a little guilty because it appears to be somewhat on top of a ground squirrel network, but exhaustion rules. The creek is lovely and ice cold and we both take off our shoes and soak our feet until they ache with the cold. We wash and wring out our sweaty shirts and cook our dinner. We’re right smack under Mount Thielsen; it’s a truly lovely spot that reminds both of us of Switzerland, but I’m too tired to even take a picture! 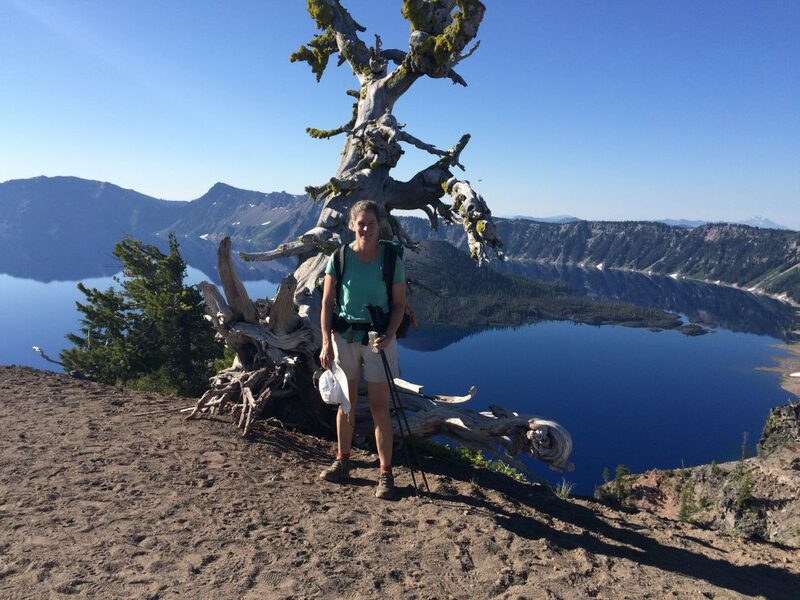 This entry was posted in Hiking, PCT Oregon 2016 and tagged backpacking, Crater Lake, hiking, Oregon, Pacific Crest Trail, PCT, trail running by gydle. Bookmark the permalink.